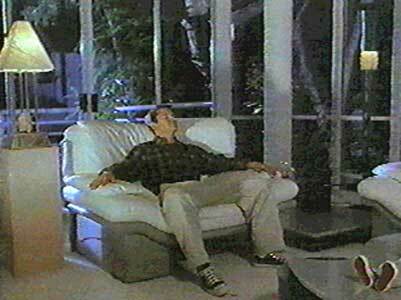 Kirk Cameron wears black high top Converse “Chuck Taylor” All Stars in the film. Title shot from the remake of this Disney film shows Dexter tying his chucks. Dexter Riley (Kirk Cameron) is a below average college student who is on the verge of being kicked out of Medfield College. Dexter and his roommates Will (Andrew Woodworth) and Tobias (Jeff Maynard) are all on Dean Valentine’s (Larry Miller) list of students that he wishes to get rid of in order to improve the academic reputation and financial resources of the school. Despite Valentine’s penny pinching, Professor Quigley (Jason Bernard) has succeeded in getting some new computers and access to the Internet for the school. When Dexter sees the potential of the Internet for helping him complete his assignments, he goes to the computer lab late at night to find a term paper about the Battle of Gettysburg that he can copy. While he is there, a freak electrical accident transfers the entire content of a computer encyclopedia into his brain. Suddenly Dexter Riley becomes a new and different person, a genius with a computer for a brain. Dexter falls for Sarah after inviting her over to the Rat House for a study session. The next day Dexter is able to complete Professor Quigley’s physics midterm in less than ten minutes. Impressed by this feat, Quigley takes Dexter to the dean’s office, and Dexter continues to amaze everyone with his encyclopedic knowledge. Convinced that Dexter is his ticket to success, the dean makes him use his special gift to promote the college. The dean can get Dexter’s full cooperation, because he threatens to expel Will and Tobias if Dexter doesn’t go along. Dexter quickly becomes a national phenomenon, sweeping all of the points on a college bowl quiz game, and wowing everyone with his brilliance. Meanwhile, Dean Webster Carlson (Dean Jones) of rival Hale College tries to get Dexter to transfer to Hale, and the leader of Hale’s college bowl team, a twelve year old genius Norwood Gill (Matthew McCurley), jealous of the instant fame and attention that Dexter has suddenly acquired, plots to discredit him. 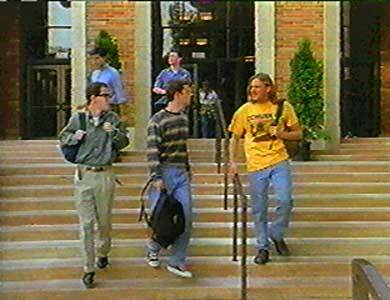 Dexter walks down the steps with his friends Will and Tobias who are skeptical of his new found intelligence. Soon Dexter’s newly found fame goes to his head, and this causes some estrangement from his friends. No one is more hurt by this than his girl friend Sarah (Anne Tremko), who discovers that she is being manipulated by Hale College to get access to Dexter, and Dexter’s attitude that he has become better than everyone else. Pressures continue to mount on Dexter, as he must go along with all of Dean Valentine’s promotional schemes, deal with the pressures of the quiz show, is investigated by the government as a suspected computer hacker, and becomes the target of Norwood’s plotting to discredit him. All of these strands come together as Medfield College faces Hale College in the college bowl competition. Dean Valentine has big plans for using Dexter to promote Medfield College. This version of The Computer Wore Tennis Shoes turns out to be much better than the original, released in the 1970s. The remake has a more interesting plot, certainly more to do with brain power and thinking, and the hero actually wears tennis shoes — in fact the world’s premiere sneaker, the Converse All Star Chuck Taylor. Director Peyton Reed has given us a pleasant entertainment with a contemporary theme. Dexter comtemplates the ironies of his new situation in life. 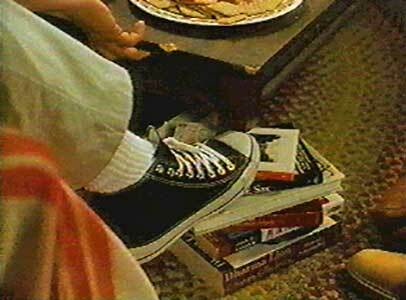 Dexter wears black high top chucks throughout the film. Dexter wears his black high tops throughout the film, and there are some good closeups occasionally, like what you see above. Chucks are well featured in this film, and as part of Dean Valentine’s promotional schemes, you see a cardboard cutout of Dexter wearing his Chucks, and even a Dexter figure, complete with Chucks. 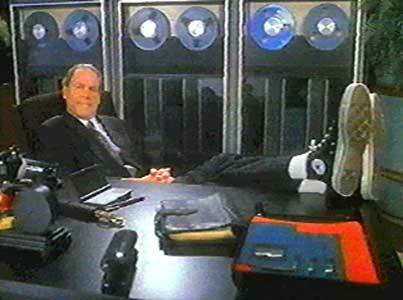 But probably the most interesting chucks scene in The Computer Wore Tennis Shoes is when you see Disney CEO Michael Eisner kick back at his desk and put his feet up, wearing a pair of black high tops, as part of his introduction to the film. 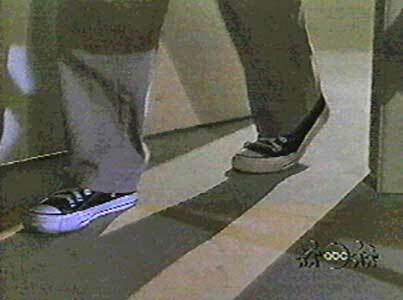 Michael Eisner shows off his chucks during his introduction to the film. The Computer Wore Tennis Shoes. (1995) Kirk Cameron, Larry Miller, Jason Bernand, Andrew Woodworth, Anne Tremko, Michael McCurley, Dean Jones. Directed by Peyton Reed. (Remake for television) Categories: Comedy, Family. 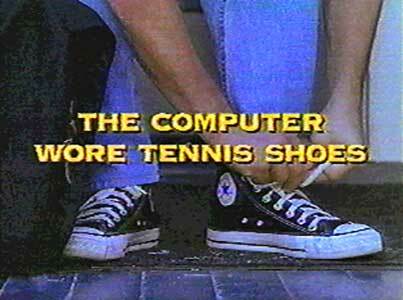 The Computer Wore Tennis Shoes is not currently available on DVD. This remake was never released in theaters, but was made for television.